Most plastic films can be recycled together because they don’t contain chemical contaminants in their film. Cling wrap cannot be recycled because it is a complex plastic made with chemicals that are difficult to remove during recycling. Whenever possible, use reusable containers instead of wrapping up food in plastic wrap. Even though major brands have discontinued using PVC in their plastic wrap, grocery stores may still use PVC plastic wrap for their deli packaging. When purchasing meat or cheese, ask for butcher or freezer paper instead of plastic wrap. What's in Your Plastic Wrap? Many companies have stopped making their plastic wrap from PVC (plastic #3), and have instead switched to LDPE (plastic #4). PVC is thought to be the less healthy choice because this plastic contains toxic plasticizers like DEHA, which can migrate into food. 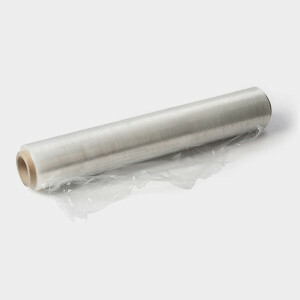 Saran Wrap recently switched to LDPE, which made their new plastic wraps chlorine-free. SC Johnson, who manufactures Saran Wrap, say they made this change because they strive to use environmentally-responsible ingredients.